Trump and Kim had been due to meet in Singapore on 12 June. US PRESIDENT DONALD Trump has warned North Korea against any “foolish or reckless” move, after he called off plans for a planned nuclear summit with Kim Jong Un next month. “Hopefully positive things will be taking place with respect to the future of North Korea,” he said. “In the meantime, our very strong sanctions, by far the strongest sanctions ever imposed, and maximum pressure campaign will continue,” Trump added. However, the US president earlier sent a letter to Kim saying that the meeting will not take place, despite Trump “very much looking forward” to it. In the letter, Trump says that the summit is inappropriate due to “the tremendous anger and open hostility” in a recent North Korean statement. Trump’s letter came after North Korea attacked US Vice President Mike Pence as “ignorant and stupid” for his warnings over the planned summit, renewing a threat to cancel the historic talks. The US President says the North Koreans talk about their nuclear capabilities, “but ours are so massive and powerful that I pray to God they will never have to be used”. Trump said that he looks forward to meeting Kim and thanked him for the release of US hostages last week. He said the cancellation meant the world “has lost a great opportunity for lasting peace” and said it was “a truly sad moment in history”. 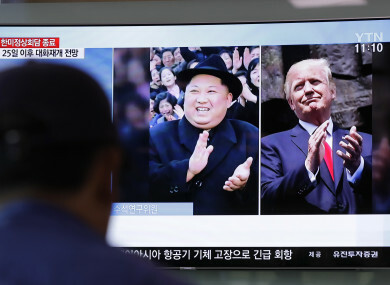 The decision came as North Korea said it had “completely” dismantled its nuclear test site, in a carefully choreographed move portrayed by the isolated regime as a goodwill gesture ahead of the Singapore summit. Email “Trump warns North Korea against 'foolish or reckless' acts as he cancels historic summit”. Feedback on “Trump warns North Korea against 'foolish or reckless' acts as he cancels historic summit”.